Cloud syncing services earn their keep by letting access your files from anywhere and with any device, but did you also know they can be lifesavers for people who stick to a single PC? The other day I was writing an article in Microsoft Word. As usual, I saved it to OneDrive, closed the app and went on with my day. Later, I opened the article again and discovered that something had gone wrong. I now had two versions that didn't match: one in OneDrive and one in my desktop. Yikes. Word asked me to choose between the OneDrive version and the desktop one. I figured the newest version must be on my desktop since that's where I worked on it last so I kept that one and overwrote the version on OneDrive. Turns out I was wrong, and my last two hours of work were gone. After I got over the sudden fear and anger, I realized I had nothing to worry about. 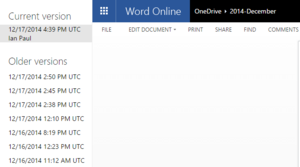 OneDrive tracks file version histories for you. If you ever find yourself in a similar predicament and you have to roll back to an older version of a document, here's how to get it done with Dropbox, Google Drive, and OneDrive. Many other cloud storage providers also offer file versioning. Dropbox lets you access previous versions of documents right from your desktop. Open Windows Explorer and navigate to your file in Dropbox. 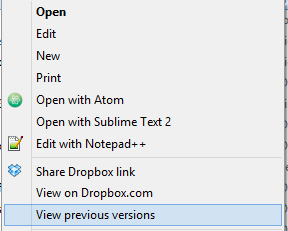 Next, right-click the file and look for the Dropbox-specific options in the context menu. Select the option called View previous versions. A browser tab will open on Dropbox.com with a list of all the previous versions of the document that are available. Choose the one you want, click the Restore button and you're off to the races. You can also view previous versions on the web by right-clicking a file on Dropbox.com and selecting Previous versions. But beware: Dropbox limits its historical versions to 30 days. Dropbox Pro users get up to a year's worth of version history. Find the document you want and open it Docs, then head to File > See revision history. On the right-hand side you'll see a list of older versions of your document. There's also an option at the bottom to see more detailed revisions. Since Google Drive automatically saves documents for you, the more detailed revisions are simply a list of more frequent save times. Once you see the version you want, click it to see a preview, and then click Restore this revision in the right-hand panel to revert back to the older version. Drive saves versions for 30 days or 100 revisions, whichever comes first, unless you tell the service to save a specific version forever. 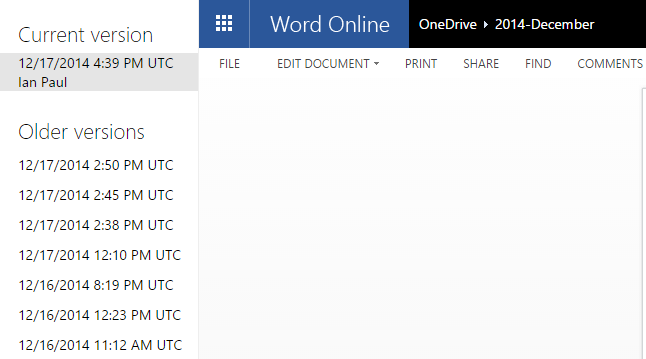 Go to OneDrive.com, right-click the file you're interested in and select Version history. The document will open and you'll see a navigation panel with a list of older versions listed by date and time on the left side of the screen. Select the one you want. You'll see a preview of the document to make sure it's the right version. If it has the changes you need, click Restore in the left-hand panel and you're done. You can also just download the document if you'd like to integrate the two documents manually. Version history isn't something you need to use every day. But for those times you really need it, you'll be glad it's there.